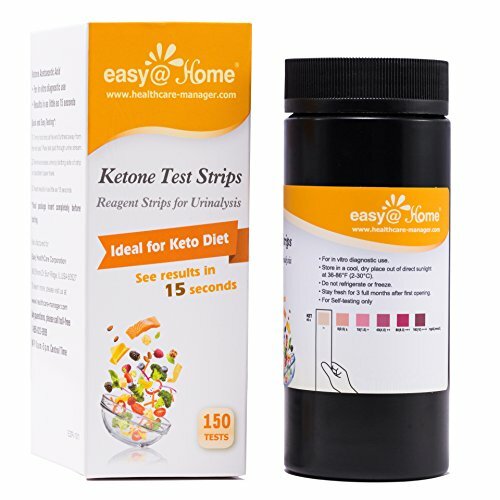 Easy@Home Ketone Reagent Strips Overview The high-quality Easy@Home ketone urine strips measure your state of Ketosis in seconds. Our professional quality keto strips provide reliable testing for people on the ketogenic, Paleo, Atkins, Low-Carb Diet. They are easy to use and more inexpensive than blood strip testing. Why Keto strips are helpful: In a state of ketosis, your body switches from depending on carbohydrates for energy to burning fats for energy. When the body metabolizes fat, it generates ketones. Ketone testing strips are used to measure the levels of ketone in your urine. Our keto strips are a quick and reliable way to know if you are truly in ketosis. When you are on the ketogenic or other low-carb diets, it can be hard to keep your body in a state of ketosis. Usually, it is recommended to have Keto diet of less than 20g net carbs or 35g total carbs per day. Keto Strips help you discover when you are no longer in ketosis and when you return to the ketosis state. This will help you clarify how your eating choices and exercise are having an effect on your keto results. So you can perfect your ketogenic lifestyle and see the results you are looking to achieve. Note: If you have been fat-adapted for a while, you may not secrete ketones and these strips may show a low amount. How Do Keto Strips Work? They measure the ketone acetoacetate in your urine, which is excreted if it is unused by the body. Do I Have To Use Strips To Know If I am In Ketosis? Short answer is YES. You should monitor your ketone level when you are on keto diet for weight loss or diabetic control. There are a number of ways to measure your state of ketosis. Keto Strips provide a quick way to know if your body is producing ketones, especially during the first couple weeks of your low-carb diet.